Yes, more books came today in the mail today, but I feel justified in having bought these. 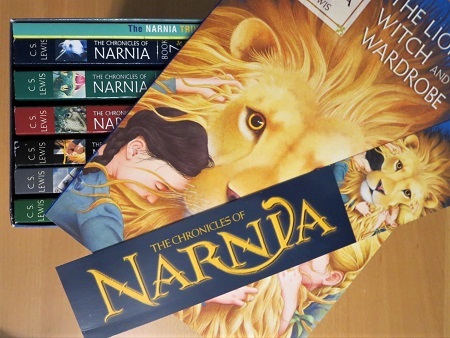 I have been needing a replacement set of Narnia books for a long time. Now that my kids are old enough to enjoy the series, I thought I should have a readable set here for them. Not that my old ones were completely unreadable, but they were all nastily foxed and tanned, plus Prince Caspian‘s spine had completely failed and pages were falling out of it. I chose this particular set because the cover art looked good, and it came with a trivia book (and also a cute bookmark, as I discovered when I pulled out The Lion, the Witch, and the Wardrobe). These are reading copies, appropriate for the rough handling they’re likely to get from children. Someday I still hope to buy a quality set of hardback copies. The order is, of course, totally wrong. I’m not sure it’s possible to get correctly numbered versions anymore.